We are pleased to announce our upcoming conference, to be hosted by King’s College London at the Strand Campus on 2nd and 3rd July 2015. For two days, we will bring together international scholars from a range of disciplines to offer new interpretations and hypotheses on culture in the British and American zones of occupied Germany between 1945 and 1949. Topics range from literature, film, music, and fine art to the role of cultural organizations and congresses during the occupation era. 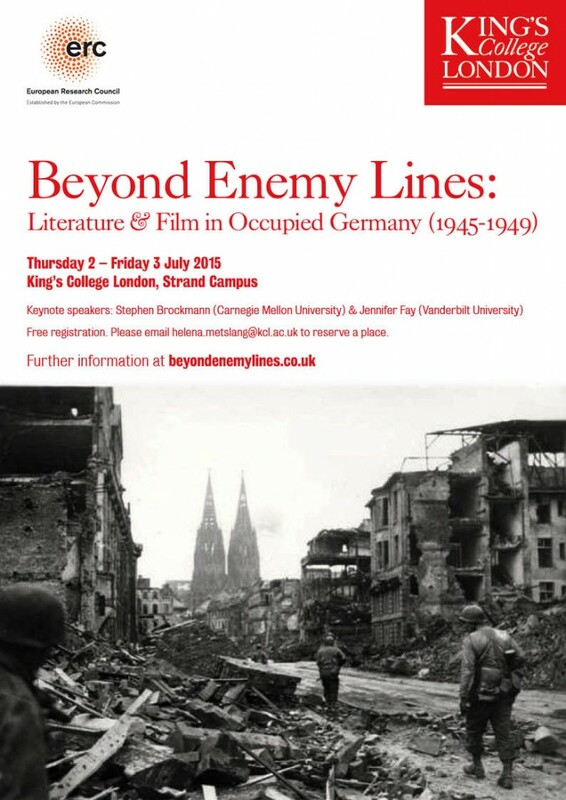 For further details, see the full Beyond Enemy Lines conference programme. We look forward to welcoming auditors from a wide range of disciplines for two days of fruitful discussions and debates. To register for the conference, please email Helena.metslang@kcl.ac.uk. Registration is free of charge. There will be a conference dinner on Thursday, 2nd July 2015, at Cucina Asellina, on The Strand. The cost for this is £35 per person (Please note: This is not covered by conference). For those seeking accommodation in London during the conference, please see our suggested list of Accommodation Options. Please feel free to download and display our conference poster. For further information, please contact the conference organisers: Lara Feigel (lara.feigel@kcl.ac.uk), Elaine Morley (elaine.morley@kcl.ac.uk), or Emily Oliver (emily.oliver@kcl.ac.uk).